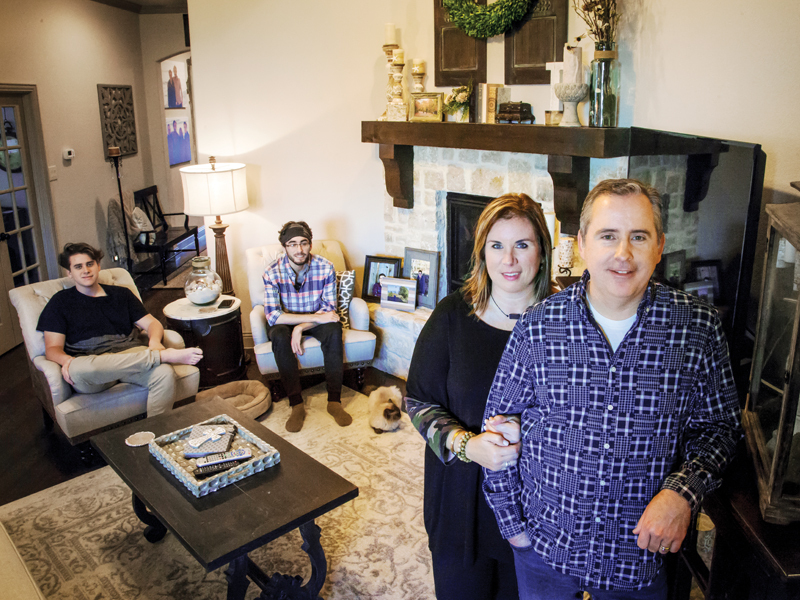 (FROM LEFT) Cameron, Blake, Michelle and Mike Patterson in their Rowlett house after a powerful Christmas week tornado destroyed it in 2015. Many breathe a sigh of relief now that the peak of another tornado season has passed in the Lone Star State. 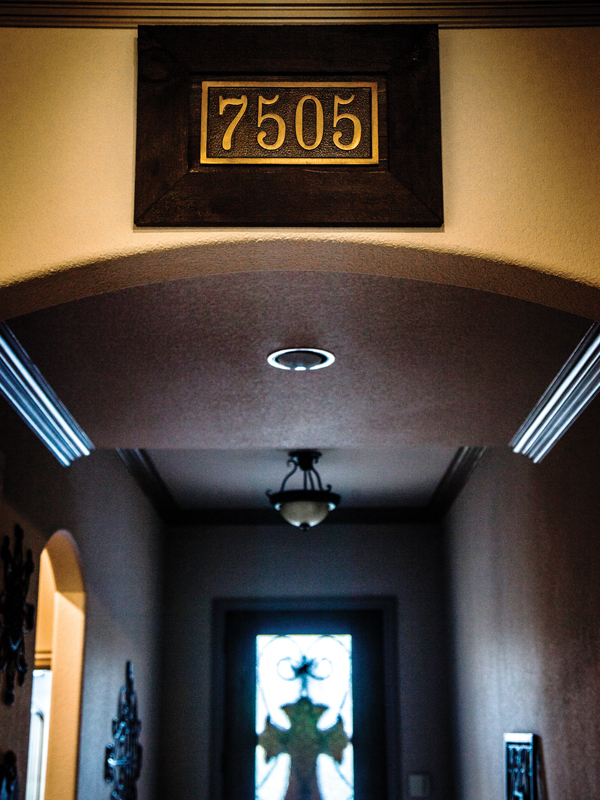 One alumni family in Rockwall, Texas, knows the feeling all too well. 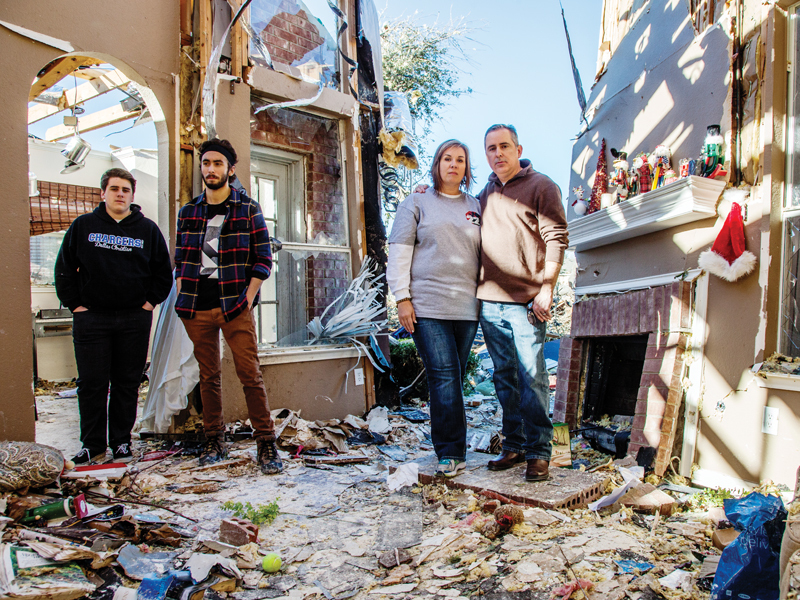 It’s taken nearly two years, but Mike (’90) and Michelle (Kehoe ’90) Patterson have put the pieces of their lives back together after an EF-4 tornado with 200-mph winds on Dec. 26, 2015, surprised people in the northeast Dallas communities of Rowlett and Garland. While twisters can occur any month of the year, they were the last thing on the family’s mind the day after Christmas. Eleven of the 52 people killed nationwide during Winter Storm Goliath were residents of North Texas. Some 1,800 houses and businesses were damaged, including the Pattersons’ house, which they share with sons Blake and Cameron. Where were you and your family when the tornado hit? We had driven to Atlanta to visit friends after spending time in Duluth, Georgia, with Michelle’s family at Christmas. 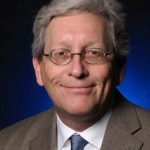 How did you find out and how did that news make you feel? The Pattersons in the living room of their new home. It’s funny how your life can turn upside down on something so mundane as a text message. When a friend back home asked, “Y’all all right?” I immediately had an idea why. We had heard the weather was a bit crazy that day with a chance of severe weather in east Dallas County. Then I got similar texts from other friends who knew where we lived. I walked to a nearby room to tell Michelle, “We might have a problem.” Within 10 minutes she received a call from one of her close friends. She and her husband had made it to our house. She could barely talk but told Michelle our roof was gone and our house was destroyed. They told us if we had been there we probably would not have survived. I was stunned and calm at the same time, but the first thought was profound: “We were not there.” I knew without a doubt that was God’s doing. It was bad. Our street, Harbor Drive, was hit hard. We were squarely in the path of the tornado. Three houses around ours were leveled. Wet sheet rock and insulation covered everything. Thankfully, only one family in those four houses was home. They had to be dug out of the rubble, but they survived. Our roof was ripped away. The wall of our living room was torn open like two outward-opening doors. A wall in Blake’s room was gone and most of his furniture and bed ended up outside. It rained for the next 24 hours, so there was a lot of water damage. All four of our cars were at home. Two were totaled and the other two had extensive damage. How did friends come to your aid in the first 24 hours? Friends salvaged the Pattersons' house number from the storm debris and presented it as a keepsake. They display it in their new house as a reminder of God's care for them. Two of our closest friends are couples who lived a mile or less away. They both managed to arrive within 30 minutes of the storm’s arrival. They were able to salvage photo boxes, my computer and some valuable documents before they sustained further damage. It continued to rain most of the next day, so a lot that might not have been damaged already was ruined by water. The day after the storm (and before we got home), emergency crews started blocking off roads and not letting anyone into the neighborhood. Fortunately, two of our friends at church are local firefighters. As first responders, they were able to bring their spouses with them and help gather more of our belongings. They put a tarp over part of our roof to shield it from the rain. Several other friends left church that morning to salvage what they could of our things. Several were looking for our cat, Bella. We found her under a wall two days after the storm, unhurt. As far as I know, we never had a problem with looters, probably because we had so many friends on site at various times. What were you able to salvage from the storm damage, and how long did it take to find them? We saved some things, but not much: a few wall hangings, some clothes and more photos than you might think. Today, I look around our new house and while nearly everything is new, some items bear scars from the storm that add extra meaning for us. While I don’t think any of our belongings were found away from our property, a lot of debris in the front and back yards was not ours. How did your employer, church, community, etc., rally around you and your family? Michelle’s employer allowed us to use it’s warehouse for storage. My employer had a bake sale and accepted donations for us. Numerous people from Saturn Road Church of Christ, our home congregation, helped clean, sort and pack things. We received support from Dallas Christian School where Cameron attended. A group of Blake’s social club brothers from Oklahoma Christian University drove down from Edmond and helped us move into our new apartment. Many people took our clothing home and washed it for us. People at church handed us checks, gift cards and cash. Some close family members paid for an extended-stay hotel the first week. We had multiple offers of places to stay and cars to use. A close friend at church put us in touch with her sister, who was the property manager at a nice local apartment complex; we were able to sign a lease four days after the storm, and they kindly waived deposits for tornado victims. People in the community came by with water, food, clothing and basic necessities. Other local churches staffed support centers providing food, water and staple goods. An ACU alum started a GoFundMe page to raise money for us. Blake and Cameron’s friends rallied around them in many ways. Our church youth minister and his wife spent time with Blake and Cameron, and our other ministers and shepherds loved and supported us any way they could. I could go on, but suffice to say there was more help than we could ever use. We were really blessed. What surprised you the most during the days and weeks following the storm, and why? We were surprised at the overflow of love and support. We knew friends would rally around us, but it was so much more than we ever expected. Random strangers would drive by and offer gift cards. So many people wanted to help any way they could. It was overwhelming to the point that we did not know how to accept it. When you’re in crisis, it’s not always easy to see how desperate you are. Letting others help was difficult but we had to learn to set our pride aside. It was comforting to have so many people – from our closest friends to perfect strangers – be there for us. On the downside, it was hard to figure out how to move forward. We knew of people going through much worse situations. We were thankful we were not at home when the storm hit, and were kept safe. We expected our “new normal” would just fall into place, but the anxiety and grief from the trauma of losing our house came upon us subtly. We had never been through anything like this and didn’t know what to expect, but we could also see how God prepared us for this time with prior struggles and experiences. It was hard on each of us in different ways, and we didn’t always know how each other was doing. We underestimated how it would affect each of us. We have all done remarkably well, but it’s been hard and there are scars. Was the decision to rebuild or move a hard one to make? It was a pretty easy decision to move on because ironically, we had been planning to relocate anyway. We were able to sell our lot to a longtime family friend who has since rebuilt and sold the house to a young family. We ended up building a new house in Rockwall, about 15 minutes from where we lived in Rowlett. What runs through your mind when you drive through your old neighborhood today? For the most part, we avoid it. I did visit regularly for about a year, mainly because I was fascinated to see the transitions to our home and the neighborhood. It was good to see our house rebuilt and become a new home for someone else. But the neighborhood will never be the same. Many did not have insurance and have not been able to rebuild. How do you look at life differently today? We never take a severe weather warning lightly. We cherish our family, friends and extended community family for what they did for us. We are watching for opportunities to help others going through their own catastrophic loss. God put us back together better than before, but it has changed us each in unique ways. Times of trial refine us and in so doing, help us learn to depend on God and trust him to lead us through the dark places. I’m thankful we have scarred reminders hanging on the walls of our house. They remind us to not forget the good times of the past, and to trust God to guide us and one day bring us home.